ATMA 2019 Selection Process - The selection procedure of ATMA exam is crucial to understand for the MBA aspirants. Only those aspirants who will clear the selection procedure will be able to seek admission into MBA programme at the participating institutes. Becoming familiar with ATMA selection process helps aspirants understand the various requirements that need to be fulfilled after the completion of the ATMA entrance exam. Generally, the ATMA selection process will begin after the declaration of exam result in the month of May. The Selection process of ATMA 2019 MBA exam is only applicable to the candidates who have appeared for the exam and have qualified for further screening rounds. So, let’s look at the key aspects related to ATMA MBA entrance exam and what are the things that you must keep in mind with regards to it. ATMA 2019 Cutoffs are the first step that candidates have to qualify in order to participate in the ATMA exam selection process. The ATMA cutoff is the minimum ATMA score that a candidate has to score in order to be eligible to participate in the further screening rounds announced by the B-school. In total, around 72 B-schools or participating institutes announce their ATMA cutoffs to shortlist students for admission to MBA / PGDM programmes on the basis of their ATMA score. Candidates who qualify the ATMA cutoffs announced by the respective B-schools will be called in to be part of the further screening rounds. The ATMA cutoffs announced by different B-schools accepting ATMA score depends on a number of different factors i.e. total number candidates applying to the B-schools, seats available at the B-school and the difficulty level of the ATMA 2019 exam. ATMA 2018 Selection Process and the key rounds therein will be conducted by the respective participating B-schools. The Selection Process for admission to MBA colleges in India based on ATMA 2018 exam covers three key rounds i.e. Group Discussion, Personal Interview and Written Ability Test. Different participating B-schools design the ATMA selection process and therefore the number of selection rounds will vary from one MBA college to another. Personal Interview is test of one’s personality in which an interview panel interviews the candidate, either individually or as part of the group. In the personal interview round, the interview plan tries to evaluate the following skills and abilities of the MBA aspirants seeking admission to the B-school. The Written Ability Test or WAT is the test of one’s ability to read and write effectively. 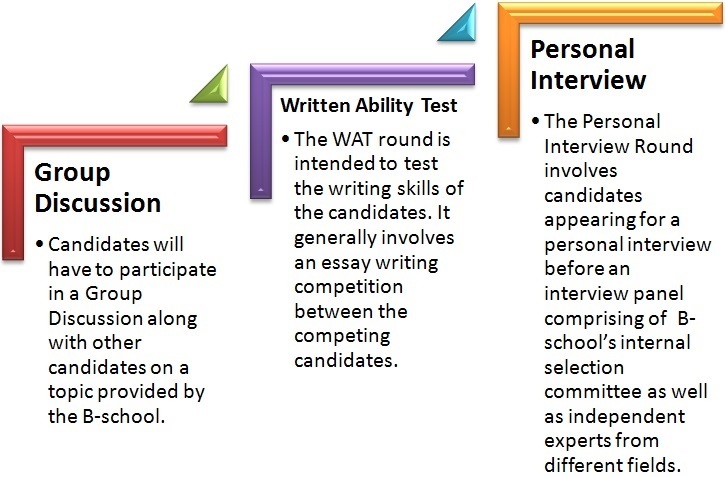 The following skills are put to test in the WAT round. The last step in ATMA selection process generally is the documentation process. Those candidates who go through the further screening round of the ATMA 2018 selection process have to complete the documentation process in order to secure and finalize their admission. As part of the ATMA selection process, candidates have to provide the following documents to complete the documentation process. For more information about ATMA MBA entrance exam, visit www.jagranjosh.com or click on any of the links provided below.